Karl Arnold was a camera-maker in Marienberg, Germany. Karl Arnold founded the company in the late 19th century, but the best-known products are several cameras from the 1930s called Karma-Flex (from Karl ARnold MArienberg). These are variously true or pseudo-twin-lens reflex cameras of unusual design, and include one SLR. 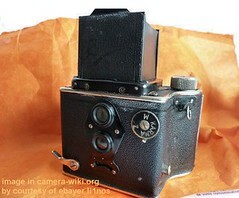 The first Karma-Flex cameras are for 127 film, and were made from about 1932. The front of the camera body is a square box with the lens (or lenses) on the front. The film is wound horizontally across the camera body, giving it a widened film compartment at the back. 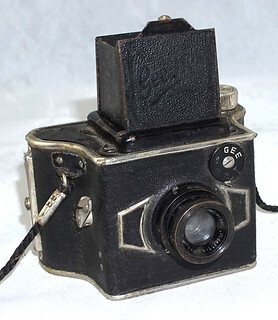 The Karma-Flex Model 1 (also sold as the Gee Flex) is an SLR, with a folding focusing hood on the top (this does not allow for use as a 'sports' frame-finder). It has a metal guillotine shutter with speeds 1/25 - 1/100 second, and either a Laack Regulyt or Ludwig Vidar lens. Model 2 is very different; it is a pseudo-TLR, built in the same body; the (unidentified) viewing and taking lenses are close together and small (f/11), with fixed focus. It has a simple 'I' and 'B' shutter and three fixed apertures. There are three red windows on the back of the camera; this is presumably to allow for film numbered only 1-8. The Linco Flex is a variant with a slightly different finder hood design. 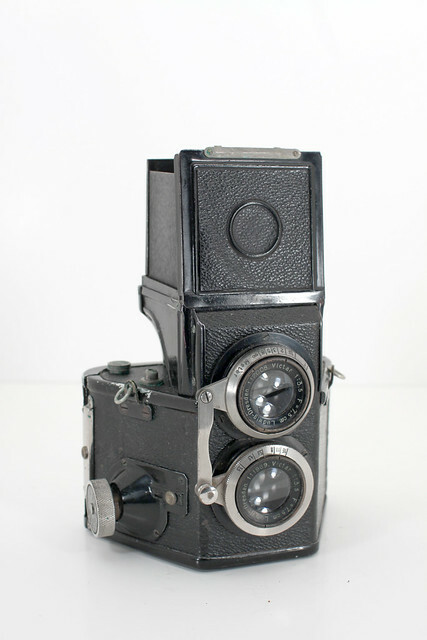 The first Karma-Flex 6x6 cm camera, from 1933, is a TLR of comparatively normal design, for 120 film wound vertically through the camera. It has Ludwig viewing and taking lenses, their focus linked with a metal rod, and a focal-plane shutter with speeds 1/25 - 1/500 second, plus 'B'. This camera again has three red windows. 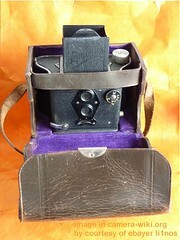 A later model (though McKeown calls it Model 1; a very similar camera was sold as the Karma-Lux) is a pseudo-TLR, little more than a box camera with an elaborate viewfinder (this can be used as a waist-level or eye-level optical finder). The camera has an unidentified, fixed-focus f/7.7 lens, its aperture adjustable to f/7.7, f/11 and f/22, and a simple shutter with speeds 1/15 and 1/50 second, plus 'B'. Model 2, pictured at the top here, is a true TLR. It has Ludwig 75 mm f/3.5 Victar viewing and taking lenses, their focus linked with a rod. The viewing lens forms the front of a viewfinder mounted on the top of a camera body (not folding into the body). 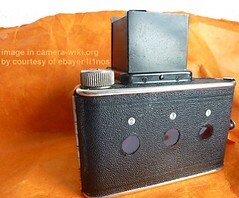 The body is very like that of the 4x4 cm cameras, with the film wound horizontally. The camera has a focal-plane shutter (armed with the large knob on the right side of the camera body) with speeds - 1/500 second, plus 'B'. The Karma-Sport from about 1935 is a development from the Karma-Flex 6x6 model 2; the focusing viewfinder is replaced with a reverse-Galilean viewfinder, making the camera much more compact. An uncoupled rangefinder is also mounted on the top plate. The camera still has a focal-plane shutter. The lens is either a Ludwig Victar, Laack Dialytar or Meyer Trioplan. The camera has a single red window and frame numbers around the winding knob (so the window is probably used only to set the film at frame 1). ↑ 1.0 1.1 1.2 1.3 1.4 1.5 McKeown, James M. and Joan C. McKeown's Price Guide to Antique and Classic Cameras, 12th Edition, 2005-2006. USA, Centennial Photo Service, 2004. ISBN 0-931838-40-1 (hardcover). ISBN 0-931838-41-X (softcover). p76-7. 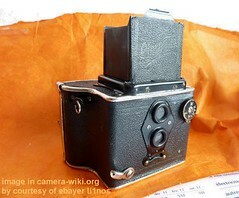 ↑ Karma-Flex 4x4 model 2 (pseudo-TLR) offered for sale at the 21st Westlicht Photographica Auction, in May 2012. ↑ Karma-Flex 'Model 1' sold at the 24th Westlicht auction, on 23 November 2013. ↑ Karma-Flex 6x6 'Model 2' sold at the sixth Westlicht auction, in November 2004. ↑ Karma-Sport with a 7.5 cm f/3.5 Trioplan, sold at the  ninth Westlicht auction, in May 2006. This page was last edited on 25 August 2016, at 05:00.